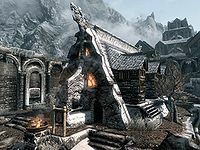 Candlehearth Hall is a large tavern in the center of Windhelm. A brief history from the tavern's owner, Elda Early-Dawn, reveals the building was originally home to a great warrior named Vundheim from the early Fourth Era. When he died in 4E 38 his son, Deroct, lit a candle above the hearth in his honor. Since that day, the candle still burns and as such the inn owes its name to this phenomenon. It is a popular destination for many of the city's folk for beverages and the performances from the bards. Nils serves as cook, but will take over running the inn if Elda dies. It consists of one area, Candlehearth Hall. * This person only becomes innkeeper if Elda is dead. † Only encountered during the Imperial Legion quest A False Front. ** These people will be exiled here if the Stormcloaks take Falkreath and it is later retaken by the Imperial Legion. Candlehearth Hall is divided into two stories, a ground floor and a top floor. The ground floor functions as a taproom and has proprietor Elda Early-Dawn behind her counter, at times chatting with the regulars. The second floor is spacious and consists of one huge room with several tables where the regulars can enjoy their drinks and the performances from the bard, Luaffyn. The top floor consists of one large room and is where most of the regulars gather during the day. Luaffyn stands in the southwestern corner, next to the ladder leading down to the kitchen. In front of her is the trademark hearth and the eternally burning candle. Facing the hearth are three chairs accompanied by tables with some assorted food, two eidar cheese wedges, some grilled leeks, a bottle of wine, one of alto wine and a salt pile. On the other side of the hearth is another table with some baked potatoes, a sweet roll, a bottle of Nord mead and one of alto wine. 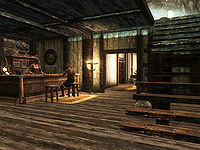 Adjacent to the stairs leading down to the bar is an exit to Windhelm and a table with an apple pie. 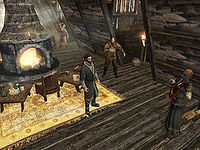 In the southeastern corner, Stenvar sits around the clock, ready to be hired as a mercenary for 500 gold. The table in front of him has a salmon steak and a honey nut treat. In the adjacent corner is the table where local author and potential quest-giver Adonato Leotelli often sits when he writes his tales of heroism. His table has a slice of bread, a boiled creme treat, and a bottle of Nord mead. The ground floor has two entrances next to each other, both of them located adjacent to the main gate of Windhelm. Both entrances open to the sight of Elda behind her bar on the left, the guestrooms and kitchens down the hallway in front, and the stairs leading to the second floor on the right. A single bottle of Nord mead stands on the bar, while Elda hides several items underneath it, including a potion of healing, an iron sword, a pickaxe, and ten gold coins. On the shelves behind her sit a banded iron shield, a potion of stamina, a potion of resist fire, along with several more alcoholic beverages, including four bottles of alto wine, two bottles of regular wine, and seven bottles of Nord mead. Down the hallway are four rooms, three of them with beds while the fourth is the kitchen and has a ladder leading up to the second floor. The first room to the right is where Nils sleeps between 2am and 8am. Along the western wall is a pair of boots on the floor, while a small dinner table in the northwestern corner holds a bottle of Nord mead, some baked potatoes, and a honey nut treat. The cupboard in the adjacent corner holds clutter and the shelves above contain a bottle of wine, a copy of the quest-related book The Legend of Red Eagle. The southeastern corner has an end table with clutter and a large food sack along with it. Near the door is a set of shelves with three food sacks and the tavern's business ledger. The first room on the left is the room you can rent for 10 gold. Just inside the door is a dresser with clothes and a bit of food on top: a goat cheese wedge, two red apples and a carrot. In the corner next to the dresser is a set of shelves with a food sack, a potion of healing, a potion of minor stamina, and a potion of resist fire. Next up is a wardrobe with more clothes and the bed. At the foot of the bed is an end table with clutter and a bottle of wine on top. 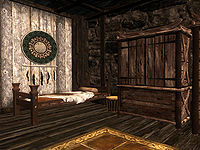 The second room on the left is reserved for the Stormcloak courier during the civil war quest A False Front, if you side with the Imperials. Save for a few items, the room is almost completely empty. The door opens to a wardrobe with clothing, and, along the northern wall, more clothing in a dresser and a bottle of wine. The owned bed stands in the southeastern corner. The kitchen is where Nils cooks every day between 4pm and 10pm and consists of a huge amount of different foodstuffs and a ladder to the second floor. In the southeastern corner is a set of shelves and a cupboard, separated by two large food sacks, and a pair of shoes on the floor. The shelves on the right contain three loaves of bread, a goat cheese wedge, a slice of raw beef, two salt piles, a sample of frost salts, a bottle of alto wine, and a sliced goat cheese. The cupboard contains clutter but has several items on the shelves above, including a food sack, a chef's hat, a bottle of Nord mead, a bottle of wine, a chunk of venison, a bottle of alto wine, and an apprentice locked non-respawning strongbox, which contains random items. Following the wall towards the cooking pot, next is a small table with more food, an apple pie, a gourd, two raw rabbit legs and a potion of minor healing. Above the table hangs some game, specifically two pheasants and a rabbit, along with two garlic braids and a bouquet of dried frost mirriam. Near the fireplace, underneath the kettles sit three tomatoes and, in a cast iron pot in the northwestern corner, a slice of bread. In the alcove leading to the ladder are four food sacks and a small table with even more food, a head of cabbage, a bottle of Nord mead, a sliced eidar cheese, four heads of garlic and three carrots. If Elda dies and Nils takes over, he will not stand behind the counter. You can, however, acquire his innkeeper services around the clock. See this article for his schedule. Fighting Rolff Stone-Fist anywhere in the city makes low-level items free to take, but all the beds are still owned until you pay for the room. The candle above the fireplace will spill blood when attacked as if it were an NPC. This is actually caused by an erroneous havok material on the chimney itself; the chimney is what is being struck. The candle itself is a generic static object. ? This page was last modified on 19 August 2018, at 20:54.